BEIRUT (AP) — Rebels have threated to storm two predominantly Christian towns in central Syria if residents do not "evict" government troops they say are using the towns as a base to attack nearby areas. A video released by rebels showed Rashid Abul-Fidaa, who identified himself as the commander of the Ansar Brigade for Hama province, calling on locals in Mahrada and Sqailbiyeh to rise up against President Bashar Assad's forces or prepare for an assault. "Assad's gangs in the cities are shelling our villages with mortars and rockets destroying our homes, killing our children and displacing our people," said Abdul-Fidaa, who wore an Islamic headband and was surrounded by gunmen. "You should perform your duty by evicting Assad's gangs," he said. "Otherwise our warriors will storm the hideouts of the Assad gangs." Abdul-Fidaa accused regime forces of taking positions in the two towns in order to "incite sectarian strife" between Christians and the predominantly Sunni opposition. Assad belongs to the Alawite minority sect, an off-shoot of Shiite Islam. The threat comes just two days after a U.N. team investigating human rights abuses in Syria accused anti-Assad militants of hiding among the civilian population, triggering strikes by government artillery and the air force. The Britain-based Syrian Observatory for Human Rights, the activist group which reported the rebel ultimatum on Saturday, said such an attack by rebels could force thousands of Christians from their homes. Russia's foreign minister, meanwhile, said that Moscow would welcome any country's offer of a safe haven to Assad, but underlined that Moscow itself has no intention of giving him shelter if he steps down. Sergei Lavrov also said that Syria has consolidated its chemical weapons into one or two locations to protect them from a rebel onslaught. Russia, which has military advisers training Syria's armed forces, has kept close watch over Damascus's chemical arsenal, Lavrov added. Syria refuses to confirm or deny if it has chemical weapons but is believed to have nerve agents as well as mustard gas. It also possesses Scud missiles capable of delivering them. 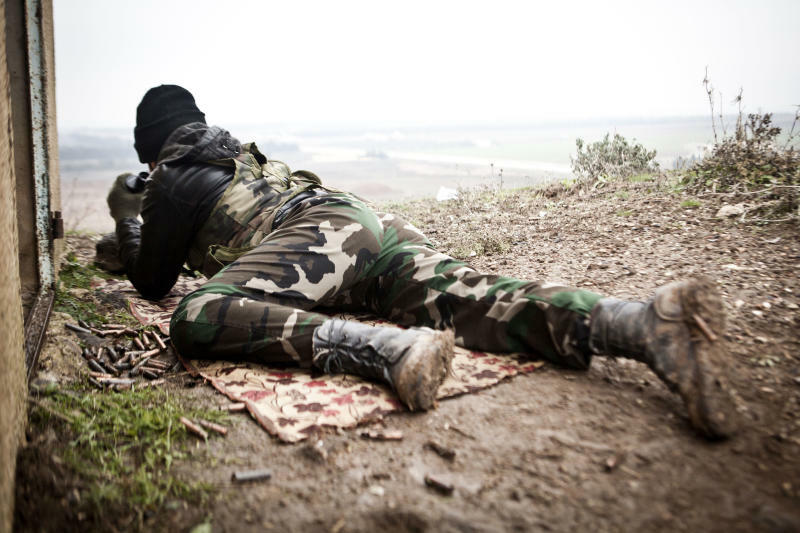 Concerns over the arsenal have escalated as the Assad regime suffers losses on the battlefield. U.S. intelligence officials have said it may be readying chemical weapons and could be desperate enough to use them. Both Israel and the U.S. have also expressed concerns the weapons could fall into militant hands if the regime crumbles. Syria's conflict started 21 months ago as an uprising against Assad, whose family has ruled the country for four decades. But the bloody crackdown that followed led rebels to take up arms, and the ensuing fighting transformed into a civil war. According to activists, more than 40,000 people have been killed since March 2011. Christians, who make up about 10 percent of Syria's population, say they are particularly vulnerable to the violence sweeping the country of 22 million people. They are fearful that Syria will become another Iraq, with Christians caught in the crossfire between rival Islamic groups. Clashes between troops and rebels in the central city of Homs, Syria's third largest, have already displaced tens of thousands of Christians, most of whom either fled to the relatively safe coastal areas or to neighboring Lebanon. Rami Abdul-Rahman, who heads the Observatory, said some Christians and Alawites have also left Hama province in the past several days to escape violence. He said some of them found shelter in the coastal city of Tartus. In Damascus, the new head of the Greek Orthodox Church of Antioch said that Christians in Syria had deep roots in the country and were not part of the conflict. Speaking to reporters in the capital, Patriarch John X. Yazigi, urged rival factions to negotiate a settlement. Violence continued elsewhere in the country on Saturday. The Observatory said a car bomb went off in the Damascus neighborhood of Qaboun, killing at least five people and wounding others. A Syrian official in the capital confirmed the blast but had no immediate words on casualties. Elsewhere, the Syrian army said in a statement carried on state-run TV that it had repelled a rebel attack on a military base that killed a regimental commander in the Damascus suburb of Chebaa. And in Damascus, the state-run news agency SANA said gunmen assassinated Haider al-Sammoudi, a cameraman for the government's TV station. Several journalists working for state media have been assassinated over the past months. 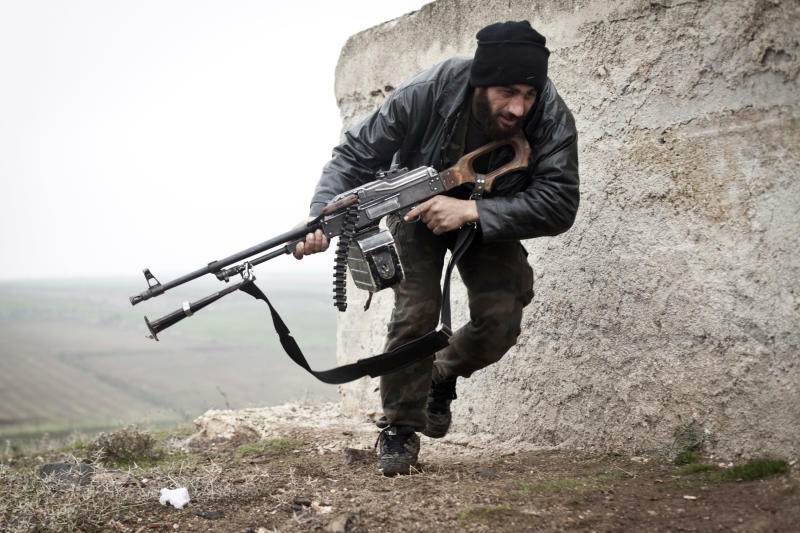 In another development, 11 rebel groups said they have formed a new coalition, the Syrian Islamic Front. A statement issued by the new group, dated Dec. 21 and posted on a militant website Saturday, described the group as "a comprehensive Islamic front that adopts Islam as a religion, doctrine, approach and conduct." Several rebel groups have declared their own coalitions in Syria, including an "Islamic state" in the embattled northern city of Aleppo. The statement said the new group will work to avoid differences or disputes with the other Islamic groups. Syrian authorities meanwhile handed over to Beirut three Lebanese citizens who were killed last month in a clash with Syrian troops shortly after they crossed the border. Syria has so far returned 10 bodies to the Lebanese authorities and says it has no more. Associated Press writer Maamoun Youssef in Cairo and Alblert Aji in Damascus contributed to this report.